Last week, reports indicated that Slack has selected the New York Stock Exchange (NYSE) for its IPO via a direct listing, which will represent the second time that a major company has pursued this non-traditional path to IPO. Last April, Spotify (NYSE:SPOT) became the first major company to successfully make its public debut through a direct listing, and, in the twelve months since Spotify listed its shares, the company has seen its share price rise to a high of $196.28 from its first day closing price of $149.01. 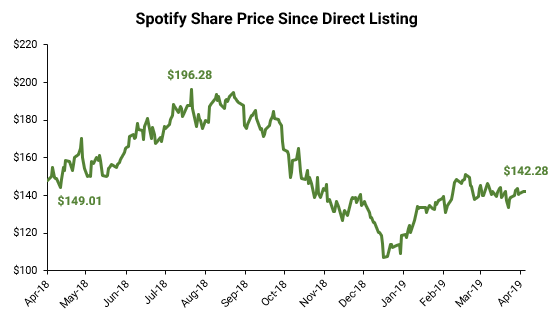 Recently, Spotify’s share price has stabilized around its IPO price, closing at $142.28 on April 8, 2019, making it easy to forget the company’s novel approach to its IPO. Now that it’s confirmed that Slack will try to replicate Spotify’s path, let’s recap what exactly a direct listing is and how it differs from a traditional IPO. In a traditional IPO, a company is listing primary shares in order to raise new capital for a variety of corporate purposes. A company hires an investment bank, or “underwriter,” in order to market its shares to institutional investors through a road show, which consists of presentations used to inform potential investors of what the company does and help the underwriter gauge investor interest. Ultimately, a share price is set by the underwriter after collecting indications of interest from institutional investors. Once the company debuts its shares publicly, the underwriter will engage in price stabilization efforts, buying and selling shares on the market in order to prop up or depress the share price. The goal is to make sure the share price stays within a relatively reasonable band of the IPO price. A direct listing or direct public offering (DPO) is where a business lists its outstanding shares directly on a stock exchange without the help of underwriters and a primary offering of new shares. A DPO also lacks typical lock-up agreements and price stabilization activities. In other words, insiders are not required to hold shares of the company for six months post-IPO, and an underwriter does not commit to buying and then selling the new shares at a certain price, thereby locking in a funding amount. Spotify chose a direct listing for five main reasons, but we believe two reasons were the driving force: 1) Spotify didn’t require additional capital as it was cash flow positive, and 2) it wanted instant liquidity for all shareholders. For a complete overview of Spotify’s direct listing, please refer to its investor day page. Today, many tech startups are going public after raising hundreds of millions in private capital, realizing that many investors finally want to exit and realize their returns and as a way of securing additional capital (as most newly-public companies remain cash flow negative). However, Spotify had the luxury of being cash flow positive, and thus did not need guaranteed capital in an IPO. Spotify was also clear that it wanted to provide immediate liquidity to its shareholders. By directly listing, existing shareholders – insiders, founders, and early VC investors – were able to trade their shares on day one. In contrast, a traditional IPO would require insiders to wait until their lock-up period, usually six months, has expired to sell their shares. In that lock-up period, a lot can impact a newly public company, driving share price down – just look at Snap, Zynga or Vonage. While Spotify had five reasons to not pursue the traditional route, we believe it also had a distinct advantage over many companies looking to IPO. Spotify didn’t need an underwriter to help explain or market the business. Spotify had a user base of 157 million monthly active users and 71 million premium subscribers in 65 countries, based on their amended F-1 prospectus. It was a well-known business that didn’t require much of an explanation about how it operated or made money. Spotify has shown the world that direct listings are a viable option for startups. In addition to Slack, it is rumored that Airbnb is considering a direct listing rather than a traditional underwritten IPO in 2019. A direct listing for Airbnb could makes sense, as it fits the Spotify profile – a cash flow positive startup with broad market appeal and a more easily understood business model. On the other hand, it is unknown whether Slack is profitable, and the company arguably does not have the same brand awareness as Airbnb or Spotify. While Slack is well known throughout the tech industry for its chat and collaboration tools, Slack likely doesn’t have the same name recognition among retail investors. In any event, blockbuster direct listings from either Airbnb or Slack may show that this strategy is here to stay, and investment banks should consider the impact of those lost future fees.